We are sold out of advance tickets for this show. There may be some limited standing room only tickets available once the show starts at 8:00 pm for $22.50. Please join us at the Freight for the farewell performance of the Baguette Quartette, a Bay Area treasure for the past twenty years, playing the music of Paris in the 1920s and 30s, the kind you’d hear sitting at a café in the Latin Quarter or dancing at a club like the Moulin Rouge! 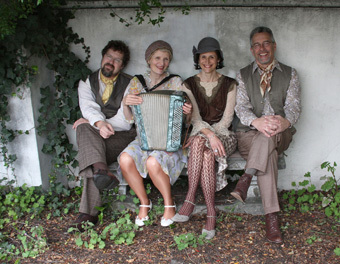 The group features Odile Lavault on accordion, bandoneon, and vocals, Rachel Durling on violin, John Schott on guitar and banjo, and Richard Trevor on string bass. Their repertoire includes tangos and waltzes, paso dobles and fox trots, marches and musettes. “It's very danceable, what we play,” Odile says. “We know how to make people jump.” The group has released six albums, including their most recent, A La Noce. Odile is a native of Paris who bought her first accordion from a flyboat captain on the Seine. She mastered the traditional Parisian repertoire playing in cafés and cabarets, moved to Berkeley in 1992, and founded the group in 1993. She frequently performs as a soloist, as well as with the trio, Parlor Tango. Rachel is a Berkeley native who has performed with such groups as the Philharmonia Baroque Orchestra, Peter Apfelbaum's Hieroglyphics Ensemble, and Orquesta La Moderna Tradición. She plays regularly with her chamber groups, the Armanino Trio and the Corvo String Quartet, and teaches at the Crowden School and Black Pine Circle. John moved to Berkeley in 1988 from Seattle, where he studied with jazz legends Julian Priester and Gary Peacock and classical composer Bun-Ching Lam. John is a member of the Grammy-nominated groove-jazz band T. J. Kirk and the avant folk-jazz-blues band, The Typical Orchestra, and has released four albums of his own, most recently Shuffle Play: Elegies For The Recording Angel. Richard, originally from the Chicago area, has played blues and R&B with many groups in Illinois and around the bay. He can also be found in the bass section of the Prometheus Symphony. Famed French bluesman Paris Slim introduced him to the musette style. Catch the last train to Paris when the Baguette Quartette celebrates twenty years of music tonight at the Freight!